Students are constantly told to "use imagination" and "think outside the box" in classrooms. Now, pupils can go one step further - their minds and eyes can witness all sorts of ideas and places, thanks to virtual reality (VR). The beauty of VR is that it is not limited to one place, time or class subject. Some Dubai schools have been taking their students everywhere (virtually, of course). There are no geographic or time restrictions in VR, meaning kids can go anywhere from Ancient Rome to taking a field trip to space and Mars - all depending on the design of that specific VR. Schools are embracing VR within classrooms and are using it as a teaching method for almost all subjects - English, history, science, mathematics, art, geography and critical thinking. "It gives students the ability to travel to and explore places without leaving the classroom and reinforces what has been explained in the class. Whether it is exploring the different terrains of Africa, exploring the African desert and getting up close to lions or even dinosaurs, exploring the human body to creating their own virtual environment and content for the world to explore. It helps the teacher to immerse, raise engagement and increases their knowledge retention of the students," David Talbert, head of technology innovation at the Dubai British School Jumeirah Park, told Khaleej Times. Using VR is one of the reasons why, in some schools, students are allowed to bring their smartphones to class. "VR presents some exciting opportunities for learning. 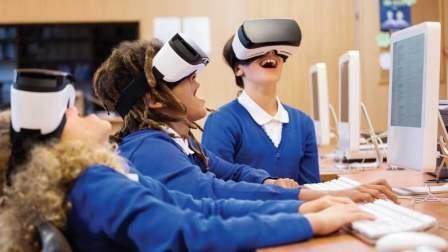 There are certain hurdles to introducing VR at the primary level as it is optimised for smartphones which most primary school children do not have," said Martha McCleary, head of digital literacy at Foremarke School Dubai. We have been using VR to visit faraway places and go on virtual field trips. This heightens engagement in lessons as children get to experience new environments. Recently we have begun looking at creating our own VR experiences. The children are busy creating online galleries of their work. Beyond learning about VR, this engages the children in learning about design and user experience." The supervisor of digital learning at GEMS Modern Academy, Ritesh Dhanak, said they have been using VR, HTC Vive, Oculus Rift, Google Cardboard and Google Expeditions in classrooms for different subjects. "VR is not just about experiencing, it is also about creating. High-end headsets like HTC Vive and Oculus Rift allow you to use apps such as Google Tilt and Blocks to create content in ways students could never do it before. "VR opens up endless possibilities for teachers to engage students for an experience that could enhance the entire learning journey. We also have VR being used for teacher professional development where they could learn about various scenarios or classroom management etc. in an immersive way," Dhanak said. Besides virtual reality, there is another technology being used in classrooms to aid in teaching and learning - augmented reality (AR). AR is where students can use their mobile phones to superimpose a computer-generated image onto any surface in the real world, which is visible only on the screen. AR is often the more affordable choice for schools as it is usually free of cost, whereas, VR headsets can range from Dh900 to Dh3,000 each. Educators in Dubai have also been using AR as a learning tool within classrooms. Both AR and VR have existed for quite some time now and I think they both have their own merit and could be effective based on the content and topic that is being covered. AR is more suited to a situation where you want to bring external learning objects into your environment whereas VR is more about virtually teleporting students to another environment. AR currently has an advantage of being more financially viable than VR because of the costing of equipment and content, but this is changing at a rapid pace," said Ritesh Dhanak, supervisor of digital learning at GEMS Modern Academy. "We use both these technologies in our classrooms - our early years use more of AR while upper primary to senior school use VR. While technology plays a big part in helping students learn, the use of them will always our pedagogy that defines what we use." David Talbert, head of technology innovation at the Dubai British School Jumeirah Park, said that both, AR and VR, can be effective learning tools. "Virtual reality immerses the students and can take them to places and inside the human body. Whereas, AR, you can have a heart in front of your desk and interact with it but you are limited to holding a device to experience it. The next step is the merger of the two, and that is where mixed reality comes in - where the real and virtual worlds are merged to create a new environment so that you can interact with in real time. This will be an effective learning tool," he said. Classrooms today are not what they used to be! Flexible seating, collaborative groupings, personal computing devices and instant access to the internet exists at all grade levels. Each day one can walk into a second-grade classroom to find students coding with robots, utilising speech to text services on their iPad and exploring their interests effortlessly. Modern-day teachers, I believe, must not only embrace the use of technology but should have a good idea of the how and why, while the students decide the what and how much. Students have their hands on equipment that allows for innovation and aids in teaching educational content. Students have game-based learning in kindergarten - they learn to be coders that makes it possible to later create software, apps, and websites. In fact, some schools are teaching coding as a foreign language. Young students begin coding with robots and child-friendly programmes like Scratch introduce coding ideas and problem-solving behaviours. As students practice, they learn to code using more complex ideas and platforms. Schools today also house new technology such as 3D printers which allow teachers to better teach geometric shapes, volume, mass, fractions, physical maps, cross sections of structures or internal organs and create new creatures to explain animal adaptations. Virtual, Augmented and Mixed reality systems create a digital learning space for students to travel to landmarks and immerse themselves in history. Virtual field trips expand the classroom beyond the state or even the country in which the class resides. With creator apps like Google Tilt Brush, Students can now create their environment rather than just experiencing pre-made ones. Even drones can help students view hard to see places, teach ratios and proportions, and create opportunities for creative writing prompts. Also adding an essential skill set which will be in huge demand by the time they graduate. When students stop considering their teacher as superior knowledge and more of a facilitator of their learning, they feel safer to take risks, play with technology and even request to change the assignment to better suit their needs. Allowing students to create VR experiences (for example) on what they learned, and thinking of new applications of technology will allow for a real change in education. If this is normal for these students, imagine their future workplaces? Imagine the technologies they will consider normal if this is what they grew up doing? Artificial Intelligence, Deep Learning, Humanoid Robotics, Big Data, Blockchain, etc. are exponential concepts which need to be integrated with the everyday learning of a modern student. As educators, it is imperative to equip ourselves with these shifts in traditional practices. The flipped classroom, student-led lessons, personalised assessment and maker approach to learning, are just a few of the many tools that can have a massive impact in shaping this Education Revolution which is taking place now. As educators, we must do what we can to prepare and equip these modern learners for the world that awaits them. How does technology help in classrooms? Innovation in education technology is stronger than before, especially due to virtual reality, mobile devices, cloud technology and the internet of things. Creativity and personal engagement are the key to truly enhance the learning experience. In my school, smart boards are used in each class. With the smart board, we can visualise and understand the topic easily. While the Stem subjects are covered and easily integrated with the new technologies, 2018 will lead teachers in the Stem programmes to develop the artistic inclinations of the students through technology. Adding art to the mix, in fact, can help us to develop critical thinking and to have a more creative approach to problem-solving. Virtual reality can immerse the student in a completely digital and expanding landscape, where they engage with teachers in transformative experiences through a wide spectrum of interactive resources. VR tools can be used to collaboratively construct architectural models, recreations of historic or natural sites and other spatial renderings. For example, learning opportunities can be enriched through interaction with dimensional objects, animals and environments for subjects like biology, anatomy, geology and astronomy. When students study, many questions come to their mind in present days. If any question comes to the students' mind, they have to ask their teacher. Sometimes, if the teacher is absent, the problem remains unsolved for the student. In situations like this, the virtual reality is very helpful, students can get their queries solved easily. The virtual reality is also helpful for students to complete their portions; this will prevent the rush that is taken by the teacher in the last movement.